The long-awaited LG G5 announcement just came and went, and we got a chance to play with the finest piece of mobile hardware LG has ever devised. This time around we have an all-metal body, volume buttons on the left side, rather than on the back. and yet the power button is still on the rear of the device, incorporating a fingerprint scanner. 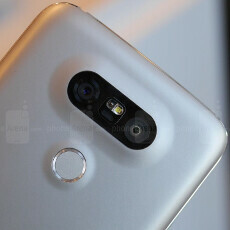 At 149.4 x 73.9 x 7.7 mm, the LG G5 is narrower and thinner than the LG G4 (148.9 x 76.1 x 9.8 mm), and the metal body has a unique modular mechanism that allows you to add various extras to the device, including a camera control piece. Speaking of the shooter, the G5 ships with a very intriguing dual-camera module, widening the field of view, with optical stabilization and laser auto focus to boot. Is it a good one when sized up to the best that the smartphone world can offer in the form of the Galaxy S6 and iPhone 6s? Well, judge for yourself, as we snapped a few comparison shots with the three puppies for your viewing pleasure. Don't give them too much thought, though, as the LG G5 is likely still not with a finalized software, and also be patient as these are the full size samples, so they may take some time to load. Why iphone 6s and samsung s6 show a better picture? It should be G5 according to camera spec recently. S6 (Note 5) much better !!! Even iPhone took better shots. Let's wait for the final software version, I am pretty sure LG will tweak things and deliver, just like they always do when it comes to cameras. Because the software is not 100% finished. I remember the S6 taking orangey looking pictures at the announcement. Liked the S6 pictures best (except for the selfie which imo the iPhone was better). Still, the G5 software is unfinished, so I'd say we wait. Looks like the iPhone 6S still got the best image quality of these three. You have to hand it to Apple. They really take camera quality seriously. True, it's a combination of good detail with very natural colors and a nice dynamic range. It's too early too tell for the G5 though. Yet you can't take wide shots on your iP. All I see on iphone is extremely zoomed in pictures with oversaturated colours, which don't make the picture better. Every pro will tell you that neutral colours are the best because you can adjust the rest in the software. Also it seems that the hdr mode wasn't enabled on the s6. Iphone and s6 saturate everything - LG photos are more natural. Both, Apple and Samsung pimp pictures by softwera. People love colorful pictures. Are you color blind? Just see the last picture and tell that again. G5 is dramatically oversaturating. now who wants the boring old design from 2015? (s6)..
GUYS, G5 will be out after 2 months and seems the phone is need a lot of development in software side. G5 looks promising....the dynamic range seems to be fine but I'll wait to see more pictures to decide. Not bad bad looking, i like how thin it is, 7.7mm is good but think i would have gottwn it if it were under 6mm. Huawei P9 come out please! wow, iPhone 6S without OIS really take great indoor shots here. kind of surprising. G4 camera is arguably better than the S6 in real-life testing. These are some pretty shtty JPEG processing. Let's hope final software will be much better because I really want the G5 to be the phone to purchase. Otherwise I'll have to go with the S7 and its bigger/better sensor (on paper anyway). Even Xperia cameras has not so crappy quality photos...( WTF, LG...?